4.8L V8 16V MPFI OHV - 8 cyl. Air Conditioning, Power Windows, Power Doors! Haul a huge payload with ease in the Chevy Express cargo van. This 2017 Chevrolet Express Cargo Van is for sale today in Winnipeg. If you need the capability of a truck, but a van body would come in handy, then the Chevy Express is perfect. The Express is an old school work van that's thoroughly modern. This cargo van can haul a ton of payload and be customized to be a perfect fit for your business. It's just as at home on the highway as it is on the worksite. The Chevy Express is a no-nonsense work van that gets the job done. This van has 26057 kms. It's white in colour. It has an automatic transmission and is powered by a 4.8L V8 16V MPFI OHV engine. This vehicle has been upgraded with the following features: Air Conditioning, Power Windows, Power Doors. It has some remaining factory warranty for added peace of mind. Our Express Cargo Van's trim level is WT. 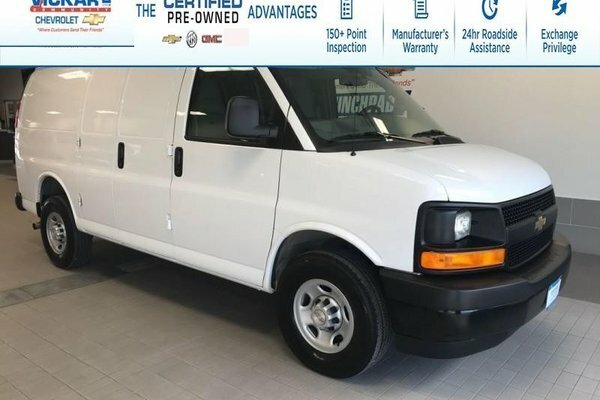 This multi purpose cargo van includes air conditioning, power windows and door locks, a tire pressure monitoring system, six built in tie down anchors, Stabilitrak stability control system, 16 inch wheels, vinyl surfaces to make it easier to clean, a 120 volt plug-in plus it even has tow haul mode to change the transmission and engine settings when you're hauling a heavy load. Buy this vehicle now for the lowest bi-weekly payment of $174.28 with $0 down for 84 months @ 5.99% APR O.A.C. ( Plus applicable taxes - ). See dealer for details.